One of the most difficult struggles a plant faces in the rainforest is getting enough light. It appears as though every square inch of the sky is closed over by the ever reaching canopy of the massive trees. The foliage is so dense that there is very little usable light left by the time it filters to the ground. The strategy utilized by these many plant families to overcome this problem is to move upstairs! Epiphytic plants have evolved to take advantage of much better conditions higher up among the branches. Here, the light is brighter, air circulation better, and there is an entire ecosystem filled with potential pollinators, nutrients and even prey. It is important to understand that epiphytes are not parasites. They only use their hosts as a perch and do not take any nutrients from them. They have evolved many different adaptations to help them in this strange environment as well. Roots, typically used for nutrient and water uptake can be modified to be hard and wiry and stick like cement. In some plants they are covered in a thick, spongy layer that helps to grab and hold moisture and nutrients before they dry up or the rain washes them away. Some plants will have leaves that grow into the shape of a basket to help catch falling leaves, debris and even animal droppings to use as fertilizer. Others have leaves that can actually absorb nutrients through their tissues. The seeds of epiphytic plants also have traits suited to a life among the branches. Some are tiny and possess long hairs that help them to catch the slightest breeze and be carried to other parts of the forest where they will settle on a branch and germinate. Other species will produce sticky seeds enclosed in bright colored berries attractive to birds. The seeds, complete with their sticky coat, pass through the bird unharmed. As the birds fly to new areas and pass their droppings, the seeds are ‘planted’, complete with a starter dose of fertilizer! Epiphytes are a strange and fascinating group of plants that exhibit some of the most interesting growth forms and habits. The diversity of species on a single branch in the rainforest can be overwhelming. 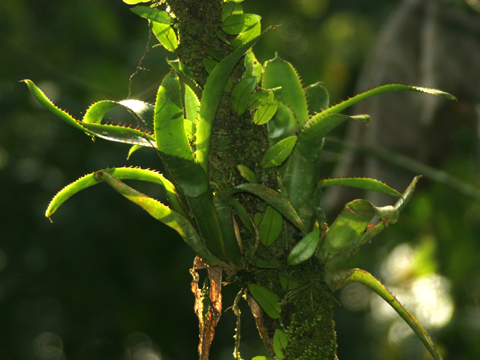 A single, large Bromeliad can support a huge range of animal inhabitants. Crabs, frogs, insects, scorpions, spiders and others can depend heavily on the plant for use as a nursery for young, hiding spots while waiting for prey and a permanent home high above the ground. Entire life cycles can take place within them. Some very complex associations also exist among these hanging gardens. Ants are a constant presence throughout the tropics and some epiphytes have developed relationships with them that are nothing less than amazing. Commonly called Ant Plants, this group also encompasses a wide variety of plant families. Some of the better known include the Myremecodia and Hydnophytums. These plants produce a large, swollen base riddled with tubes and chambers that provide homes for several species of ant. In exchange for a place to live, the ants help to protect the plant from leaf eating insects as well as provide much needed fertilizer, scarce among the branches. Indeed, some of the chambers are lined with specialized cells that will absorb nutrients from the ant’s waste. Some other ant plants include Dischidia and Hoya, tropical members of the Milkweed family, or Asclepiads. These vining plants can provide ant housing that varies from simple to extreme. Some species have leaves that are relatively flat and are held against the tree trunk making a protected home for the tiny insects. Others have hollow, inflated leaves that look like little balloons that provide more spacious accommodations. Roots will grow within these modified leaves to take advantage of the nutrient rich waste of the ants. Other plants also have relationships with insects that are not so mutually beneficial. Several carnivorous plants also call the tree tops their home. Some, such as the tropical pitcher plants, or Nepenthes, may begin life on the forest floor but can eventually abandon their roots as they climb into the branches above. Commonly called Monkey Cups, these plants produce pitchers that dangle on curled tendrils at the tips of the leaves. These pitchers are filled with a digestive fluid and are very attractive to flying insects. Promised a meal of sweet nectar, the insect soon loses it’s footing and falls to a watery death where it is eventually digested. Other carnivores seek much tinier prey. The Genus Utricularia produce some of the most beautiful flowers in carnivorous plant family. They get their common name of Bladderwort due to specially modified roots that possess tiny traps, shaped like a bladder, that catch tiny insects, nematodes and other microfauna. Some species will even grow within the pools of water created by the leaves of Bromeliads, the only obvious sign of them being the large, flag-like purple flowers. Other epiphytes may not have intricate relationships or trick up their sleeves, but are simply beautiful. Epiphytic Cacti of the Genus Epiphyllum produce some amazing blooms. Many species are night blooming are known for their huge, stunning white flowers. Pollinated by bats or large moths, seeing these plants in bloom in the wild is a sight we will never forget. Many of them have an intoxicating scent as well. Gesneriads, relatives of the African Violet, can have pendulous stems that hang like curtains from the branches above. Emerging from among the small leaves, tubular flowers in bright reds, purples and yellows reach out for their hummingbird pollinators. This incredible diversity is the backbone of a habitat involving countless species of insects and animals that may never leave the canopy during their lifetime. The populations of epiphytes sometimes become so massive that the branch can no longer support the incredible weight and comes crashing to the ground. They are truly one of the most rewarding groups of plants to grow, adding a whole other level of enjoyment to the keeping of terrariums. Some of them even make stunning houseplants. Let us help introduce you to this wonderful group of plants.